After years of struggling with anxiety and OCD, Dymatize athlete Mike Hildebrandt fought back. By relentlessly pursuing physical fitness, he broke through his own mental barriers and came out stronger than ever. When you see Mike Hildebrandt onstage, in the popular Dymatize Transformed training plan, or in his videos, you think to yourself, "Now here's a confident young man, with a physique like a Roman god, ready to take the world by storm." It definitely wasn't always this way. The fact that someone who was once ruled by doubt and anxiety can be so self-assured today is a testament to the widespread value of physical fitness. Growing up in the small town of Idaho Falls, Idaho, Hildebrandt was a lot like other kids his age, always playing baseball, football, soccer, basketball—just about any sport he could find. But even as he did well in sports, he was afraid of failing, of pressure, of things he couldn't control…of pretty much everything. "I struggled a lot with obsessive-compulsive disorder, anxiety, and fear," he recalls. "Part of the reason I got into fitness was to try to shift my focus away from all the things I was obsessing over—all those things I'd been struggling with for so many years." Day after day, Hildebrandt headed to the gym to go through his lifting routine. He put himself on a clean, athletics-focused diet. And he started pushing hard to improve his physical conditioning. He stayed on this path until he was a college sophomore and went to his first bodybuilding show. "I saw those guys up on stage and I said to myself, 'That's really cool. I want to do that!'" Hildebrandt recalls. "And a year later, I was up on that stage myself, and I loved it." He didn't win, but his life had changed. 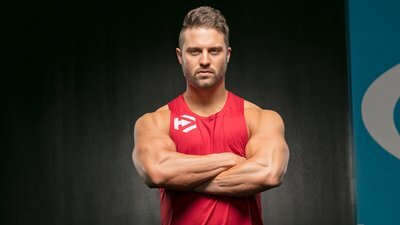 Having been bitten hard by the lifting bug, he started looking for any opportunity to get deeper into the fitness community. He finished his degree in exercise science and became a personal trainer. And he continued to compete in bodybuilding events, including a famous one held by Bodybuilding.com. "The Bodybuilding.com Spokesmodel Search was a huge opportunity for me," Hildebrandt says. "Becoming a finalist gave me more exposure, and in October 2015, I was fortunate enough to meet with Dymatize and sign as one of their sponsored athletes." Now fully immersed in the world of bodybuilding, Hildebrandt loves everything about it. Yes, he loves being up on stage, but he also loves the daily habits of training and dieting, and the way he can see changes in his body. "Bodybuilding gave me control over the way I look," Hildebrandt says. "I think that's important in a world where we have so little control over the things that happen around us." Perhaps one of the most important ways he took control was through consistency. He says it doesn't matter if you've been lifting for 10 years or if you just started yesterday. All you need to transform your life is to keep doing it. "I think that's where a lot of people fall short," says Hildebrandt. "Maybe they're really good Monday through Thursday, but then they just go off the wall over the weekend. But if you keep after it day after day, you're going to get results." Hildebrandt is often surprised that some people think competitive bodybuilders are somehow different—that they're fully motivated to go to the gym every day and bust it out and they never want to lay on the couch all day eating pizza and watching football. "I have the same challenges everybody else does," he says. "What makes the difference is being able to push through it and find a way to keep moving forward, regardless of the challenges you face." And what do you get for all your hard work? Like Hildebrandt, you might be able to build an incredible physique. You may even be able to build self-confidence or conquer the demons that hold you back. But for him, it's even more than that. "Fitness has changed the whole trajectory of my life," says Hildebrandt. "The biggest decisions I've made have all hinged on fitness: where to go to school, what to study, and what to do for a living. It even helped me find the woman who became my wife. I've made so many great friends and built so many great relationships in the fitness community. I can't even imagine where I'd be without it."